Fold a square piece of paper in half horizontally. The fold A back to bottom center (D), and B forward to front bottom center (C). Pull C (the front) and D (the back) apart all the way until you have a flat diamond (as in samll diagram). Fold top layers of C and D inward to center line at E and fold down F along dotted line. You paper should look like this. Now her's the tricky part: Unfold step 4. Take top layer only at G and puttl it up making use of the crease (dotted line). This allows poins C and D to fold back to center line along creases. Turn paper over and repeat steps 4, 5, and 5, ignoring new flap topped by point G.
With split at bottom, fold H and I inward so that edges meet center line. Turn paper over and repeat. Temporarily open flaps at (L1 and L2). 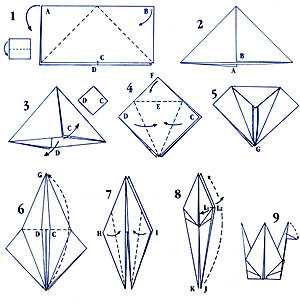 Repeat with K. Fold down wings.